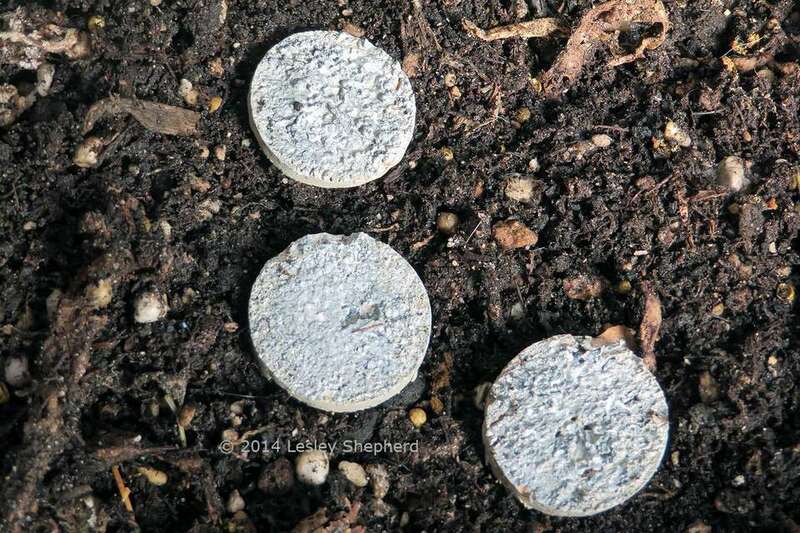 This is a very easy way to make faux concrete pavers for a fairy garden or dollhouse path. The faux aggregate concrete pavers shown here are slices of a recycled wine cork, painted with acrylic paint. The cork will stand up to moisture in a fairy or miniature garden, although paint may flake away if the ground becomes too wet. These pavers can be set into low groundcovers (like the various creeping thymes or knawel cushion ) or set directly onto soil, or gravel (for a scale gravel effect look for aquarium gravel or budgie grit from the pet store. To make slices of cork for fairy garden pavers I set a recycled wine cork against the wall of a miter box and used a fine tooth razor saw to cut slices from the cork. The slices should be roughly the same thickness, or you can mark your cork so your slices are very close in size. If you don't have a razor saw you can use a sharp kitchen knife or a craft knife with a long scalpel blade to cut cleanly through the cork. The razor saw leaves a rough surface which is easy to paint to look like exposed aggregate. If you prefer, you can slice your cork end to end instead of crosswise, to make rectangular pavers. For these you slice through the cork just like you were turning a tree into planks or boards. The sides of your rectangles will be slightly rounded, but you can trim them off if necessary. Try to cut through the lower end of your recycled cork, to avoid having holes in your pavers (made from the cork screw) Softer plastic corks can be used as well, but you may need to paint them with an undercoat (base coat) in order to get them to accept acrylic paint. Once you have your cork slices cut, you can paint them or apply an exterior rated clear coat finish (to all sides) to preserve the natural look of the cork. As the pavers will be set onto a soft surface (in soil for a fairy gardn or on a foam base for a dollhouse garden) they do not need to be the same thickness. They can be pressed into the soil or foam to different depths in order to appear uniform to the onlooker. To preserve the natural look of the cork, use an exterior , uv resistant clear coating which will stand up to moisture. Apply it to all sides of the cork to help it stand up to moisture the cork may absorb from the soil. To make pavers which resemble concrete, see the next step for suggestions for painting your pavers. To paint a faux concrete surface for your fairy garden pavers, first paint the entire slice of cork with acrylic paint (exterior paint if possible) on all sides. I used a grey / brown 'mud' shade for my base coat. Allow this coat to dry thoroughly before painting on the next color. The next step is to take a darker shade (I used a basic grey) and stipple it with a stiff brush using the dry brush technique to make fine speckles of paint. Allow the paint to dry thoroughly. Finally you can add as many highlights of black or white as you feel you need to get the look of concrete aggregate. Again use the dry brush technique (taking most of the paint off the brush onto a piece of paper) before you pounce the brush lightly against your paving stone. Allow the final colors to dry throughly, then apply a coat of matte or semi gloss clearcoat to get your final effect. If you prefer to have a solid walkway of pavers through your miniature garden, cut a piece of high density insulation foam to the size and shape you need, and use the faux stone wall technique, combined with the pattern from the fan paver technique to create a faux paver surface. Color the pavers to resemble traditional street cobblestones.